In 1969 Bill France was NASCAR and Ford was after the Manufacturers’ Championship. They had been working all winter on a super speedway killer car, one that would be aerodynamic and dominate the high banks of Daytona and the new Talladega track. Nine Ford Talladega prototypes were built to test the cars potential. It was a home run so Ford decided to go into production and eventually built approximately 750 production Talladegas. However, those prototypes were never intended for sale to the public and usually all were destroyed, used as show cars, or used for safety test crashes. This car was special. 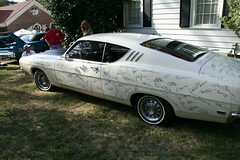 Ford presented this car to Bill France. France took the car and put it on display during Speed Weeks at Daytona and had every driver from the Daytona 500, 24 Hours of Daytona and the motor cycle races autograph the car! If you want to see more of this Feature Car, Click Here.